Check out Sam Torrance and Adam Kreek in the Monday Mag! A great interview showcasing the importance of creating a local, sustainable fuel source. Unfair Taxation - Motion to be Presented at UBCM! Oct 2011 Update - Although the resolution did not go through at UBCM (there was not enough time), we would like to thank Mayor Phil Kent and Councillor Joe Thorne for lobbying on our behalf and taking the time to personally speak with the Minister of Finance regarding the unfair taxation of biofuels in B.C. The next step is to take this issue forward to the Province! Whereas the Province of BC has mandated the reduction of fossil carbon emissions and the use of renewable fuels through the Greenhouse Gas Reduction (Renewable and Low Carbon Fuel Requirements) Act. And whereas the removal of Motor Fuel Tax exemptions and the additional application of the Carbon Tax to the production and sale of pure (100%) biofuels in 2010 has had a negative impact on biofuel producers and suppliers within BC, and has resulted in a decrease in the availability of pure renewable fuels that have the greatest potential to reduce fossil carbon emissions. Therefore be it Resolved That the Province of BC immediately remove the Carbon Tax from the entire biofuel portion of all fuel production and sales and restore the Motor Fuel Tax exemptions to the biofuel producers and suppliers of British Columbia, and provide further incentives to ensure that the renewable fuel sector continues as a viable industry for BC Consumers and provincial Greenhouse Gas reduction objectives. Harmac Donates Containers to CEA! 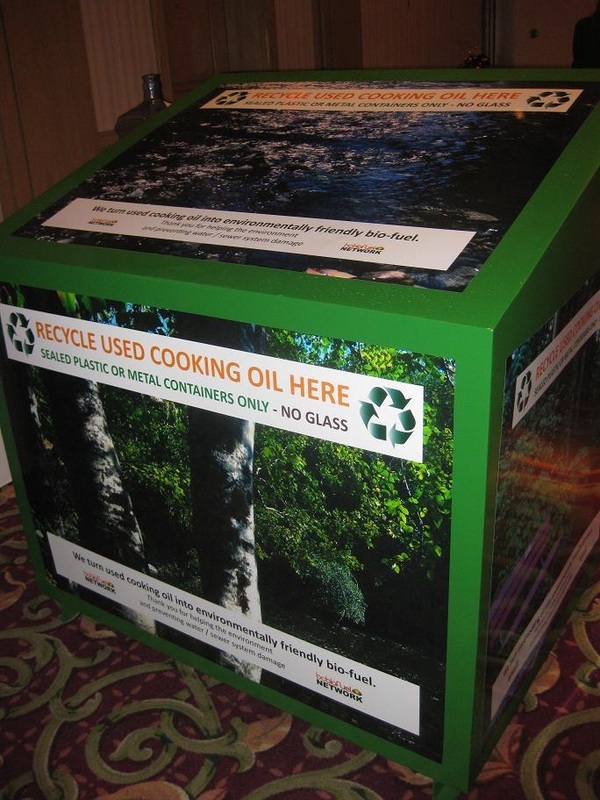 June 2011 - The Harmac Pulp Mill has donated 400 used totes to Cowichan Energy Alternatives for us in the growing B.C. Biofuel Network. Thanks to their generousity, these containers will be diverted from landfills and put to good use storing bio-diesel! March 2011 - Read the feature on CB-DC by Aaron Bichard in the Cowichan Valley Voice! 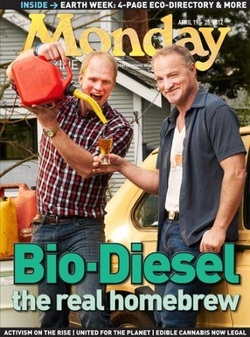 A feature story about the Cowichan Bio-Diesel Co-op's automated cardlock pump at 2999 Allenby Road. "Environmental consultant Brian Roberts knows that cars' fuel-injection systems don't like prawn tails. The president of the Cowichan Bio-Diesel Co-op, which opens its first pump today in Duncan, has been cleaning fish-and-chip bits from cooking oil recycled from local restaurants for the past three years to create an environmentally friendly local fuel. 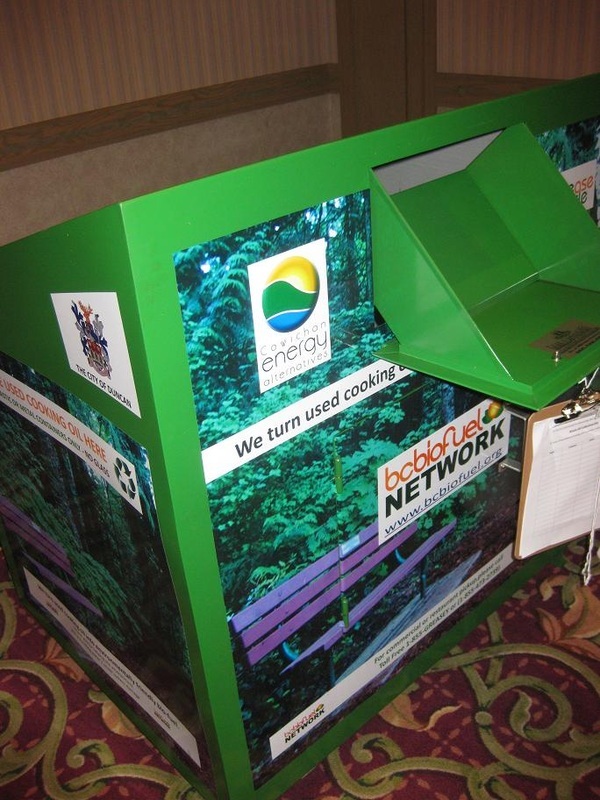 CB-DC recently had a carbon footprint assessment carried out by Cowichan Energy Alternatives. The results are in and we are proud to announce that through the production and use of completely recycled biodiesel, CB-DC has prevented over 520 tonnes of GHG emissions from entering the atmosphere! We were also able to aggregate carbon credits form these greenhouse gas reductions and we will be putting these credits up for sale on the Community Carbon Marketplace in order to continue to fund this initiative.